Janice Markham adapted this Award-winning children's book by James Thurber into a theatrical event for all ages. 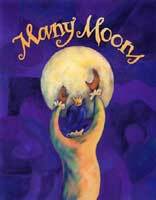 This popular production of Many Moons was performed at The Historic Ivy Sub Station, The Los Angeles Children's Museum, as well as numerous schools and libraries. A portion of the tour was sponsored by The Crossroads School for the Arts and Sciences.